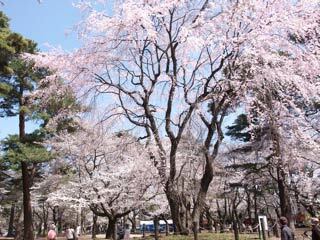 Omiya Park (大宮公園) is one of 100 best Sakura Spots. It is located in Omiya, Saitama. There are about 1,200 Sakura in Omiya Park, and they bloom in early April. Many people around this area visit here and enjoy their Hanami Party. It has also the light-up Sakura at night. During the Sakura season, there are many food stands for Hanami Party. Light-up and food stands appears when Sakura Bloom (from the end of March to the beginning of April). Sakura are located around the pond.